Preclinical studies involve biochemical and biophysical characterization of the antibodies and peptides, as well as functional evaluation of their activity in in vitro and in vivo assays. These assays are performed on laboratory animal cells, and their purpose is to document information on efficacy, safety, and pharmacological characteristics that precede the conduction of clinical tests in human beings. 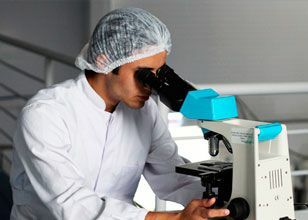 For the characterization of ReceptaBio antibodies and peptides, preclinical studies were performed in part by ReceptaBio researchers, but also counting with several partnerships in Brazil and abroad. Analytical studies and affinity assays were performed by the ReceptaBio team at the Monoclonal Antibodies Laboratory at the Butantan Institute, in collaboration with Prof. Dr. Ana Maria Moro, for the RebmAb100 and RebmAb200 antibodies. Functional characterization, with in vivo assays, were conducted for RebmAb200 antibody by ReceptaBio researchers, in the laboratories of the Center of Nuclear Medicine of the Hospital das Clínicas of FMUSP (CMN-HCFMUSP), in collaboration with Prof. Dr. Carlos Alberto Buchpiguel, Director of CMN-HCFMUSP and Prof. Dr. Roger Chammas, Full Professor of Department of Experimental Oncology, FMUSP. For peptides, the assays are carried out in the Department of Microbiology, Immunobiology and Parasitology, Unit of Experimental Oncology, under the coordination of Prof. Dr. Luiz Travassos. On the other hand, immune-histochemistry tests aim to determine the biochemical affinity of the antibodies with normal and tumor tissues of different types of neoplasia. Immuno-histochemistry of ReceptaBio’s RebmAb100, 200, 300 and 400 antibodies was carried out by researchers from the Laboratory of Medical Investigation 14 (LIM-14), College of Medicine, University of São Paulo, under the coordination of Prof. Dr. Venâncio Avancini Alves, Full Professor of Pathology, internationally renowned scientist in the area. Clinical studies aim to assess the safety and efficacy of drugs in patients. Classically they are divided into the following phases: Phase I (safety, dosage and pharmacology assessment), Phase II (safety and efficacy), Phase III (comparative efficacy and safety) and Phase IV (post-marketing therapeutic use) studies. Phase I studies with RebmAb100 were conducted in the United States and Australia by Ludwig Cancer Research (LCR) Institute, by (NCT00084799; NCT00072410; NCT00006099; NCT00006046). After Phase I, ReceptaBio developed protocols and performed Phase II clinical tests with its RebmAb100 monoclonal antibody. These protocols are prepared by the company's medical team in collaboration with the LCR scientists. The clinical tests are performed in strict compliance with Brazilian and international regulatory standards, in order to guarantee its licensing in the international market. These studies are performed in excellence hospital centers with documented experience in clinical trials. The protocol of the clinical study RCP-Ov-01.06, "A Phase II Study of Hu3s193 Therapy for Patients with Platinum-Refractory or –Resistant, Ovary, Primary Peritoneum and Uterine Tubes Adenocarcinoma" was prepared by Dr. Óren Smaletz, MD, then ReceptaBio Medical Director, in collaboration with scientists from the company Biocancer, led by Prof. Dr. Alberto Wainstein, PhD. Conducting the study was approved by the research ethics committees (RECs) of the participating centers and by ANVISA. The study was also registered in the United States to meet the requirements of the US Food and Drug Administration (FDA) within the IND (Investigational New Drug) process; it is registered on clinicaltrials.gov under the number NCT00617773 (Hu3S193 in Treating Women With Ovarian Epithelial, Primary Peritoneal, or Fallopian Tube Cancer). This clinical study gave rise to a poster, presented in 2011 at the ASCO (American Society of Clinical Oncology) conference, the most important event in the area of oncology, and was later published in Gynecologic Oncology, in 2016 (A phase II trial with anti-Lewis-Y monoclonal antibody (hu3S193) for the treatment of platinum resistant/refractory ovarian, fallopian tube and primary peritoneal carcinoma). The second clinical study involving the administration of RebmAb100 antibody to patients with ovarian tumor was developed by Dr. Óren Smaletz, MD then ReceptaBio Medical Director, in collaboration with Ludwig Cancer Research (LCR) Institute scientists. The protocol of the clinical study RCP-Ov-01.10, A Phase II study of consolidation Hu3S193 therapy in patients with recurrent, platinum-sensitive, ovary, primary peritoneum or uterine tubes adenocarcinoma, who achieved a second complete remission was approved by the research ethics committees (RECs) of the participating centers and also by ANVISA. The study was also registered in the United States to meet the requirements of the US Food and Drug Administration (FDA), within the IND (Investigational New Drug) process and registered in this agency. This study had the participation of 10 Brazilian research centers, covering the Northeast, South and Southeast regions. The study was aimed at patients with ovarian cancer who did not show signs of the disease after a second treatment and was aimed at increasing the chance of the disease not returning or delaying a possible reappearance of the tumor. It was registered on clinicaltrials.gov under the number NCT01137071 (Consolidation Therapy With Hu3S193 for Women With Ovarian, Primary Peritoneal or Fallopian Tube Cancer). This clinical study was sponsored by the Ministry of Health (MoH) and the National Council for Scientific and Technological Development (CNPq), through the National Oncology Research Network. ReceptaBio was chosen as the MoH and CNPq partner company to perform this clinical study, in which the monoclonal antibody RebmAb100 was administered to patients with breast cancer, as stated in CNPq Notice 052-2009. Under the terms of this partnership, ReceptaBio authorized the use of the antibody and transferred its know-how in conducting multicenter clinical studies for the seven participating institutions of the Network. The protocol of this clinical study, A Multicenter Phase II Study of Hu3S193 Treatment in Women with Advanced Breast Cancer with Progression after Hormonal Treatment, was approved by the research ethics committees (RECs) of the participating centers and also by ANVISA. The study was registered in the United States to meet the requirements of the US Food and Drug Administration (FDA) within the IND (Investigational New Drug) process. This study is intended for the treatment of patients with advanced breast cancer who had progression of the disease after one or two hormone treatment lines and was registered on clinicaltrials.gov under the number NCT01370239 (HumanaH - Hu3s193 in the Treatment of Advanced Breast Cancer After Hormonal Therapy).